You are a Boomer or Senior considering the joys of retirement. Some of your friends have already taken the plunge. Sleeping late, playing golf or tennis, volunteering at your favorite charity, finally tackling your list of personal projects, wandering the globe, spending more time with your grandchildren, and just loafing seem very attractive. So should you put in for the gold watch? This is the time to fulfill your career dreams, to make a truly lasting contribution to your company, industry, and profession. Many obstacles kept you from realizing your true potential earlier; now is your time to make your mark. The global economy needs your knowledge, skills, and, most of all, your wisdom. Guess what? You'll actually be more valuable to your family and society and your favorite causes and you'll find more time for travel, sports and hobbies if you continue to receive pay for your contributions. 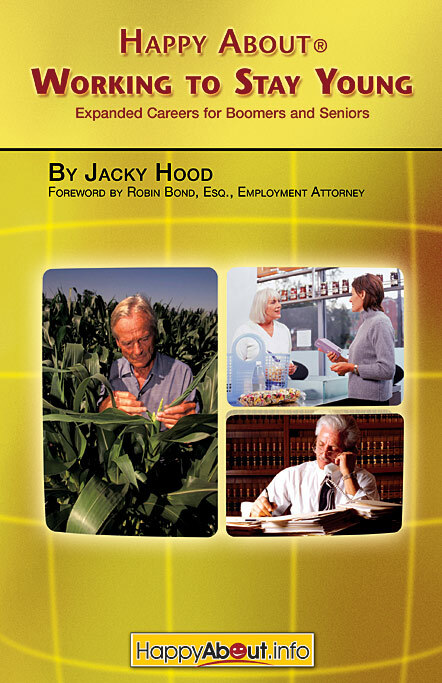 This book will provide you with dozens of reasons to have a job or a career after 60 both for yourself and for others. Beyond that, it will show you how to achieve these goals in a youth-oriented society. "Jacky Hood challenges us with a crucial question at her "Third Stage of Your Career" workshop. That is, what legacy do I wish to leave at this part of my career? She deftly facilitates participants to discern our primary values, life goals and dreams, and leads us to ponder and determine what actions to take which could fulfill these key considerations." "Jacky has created a timely and very useful workshop and her energy and facilitation skills ensure an absorbing and stimulating experience." "In our work with older adults, we know that boomers are redefining retirement and designing their futures to remain vital and productive. For many, this will involve working long after the traditional retirement age of 65. Jacky makes a strong case for always working 'in retirement' and gives a roadmap for having it all while continuing to work." "Very timely and well thought out. Jacky Hood, addresses many questions and concerns that 50-60 year olds are thinking about, but do not know where to go to get the answers. Well, here they are in one place. A thoughtful and provocative book." What's the plan to take control? -- Jacky Hood brings fresh & needed perspectives." An employer will buy it to understand the needs/wants of potential employees. "The western world faces a severe labor shortage in the coming decades. We can offshore more jobs, import more workers, or convince workers to retire laterincluding you! It's almost unfair to society for you to withdraw your talents in a time of need." "You can have it all: autonomy, income, and free time." "The first two weeks on the job set the pattern. Demonstrate that you can leave at 4pm and still make a strong contribution. Junior workers put in 80 hours one week then need 80 hours the following week to correct mistakes." "Good posture and a smile are as effective as liposuction and facelifts -- and less expensive." 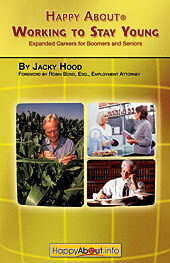 Jacky Hood became an engineer when few women entered the profession. She rode a bicycle across North America at the age of 41. Her mother retired at 81; Jacky intends to work even longer. She is a management consultant and teaches classes on career strategy, customer service, corporate governance, and business management. Her clients include Philips Medical, RAE Systems, Ellie Mae, Sun Microsystems, and many other firms. Jacky has held management positions at Hewlett-Packard, SlamDunk Networks, IBM/ROLM, and other companies. She is CEO of FieldDay Solutions and an instructor at Chalk Institute, Foothill College, and UC Santa Cruz Extension. This is Jacky's fourth book..